Summer has begun and its all fun time for kids, all bright and sunny around them with lots of time to play. Even though she plays a lot in her school, the moment she wakes from her sleep , she wanted to go out and play in the park , where her school friends will accompany her.She was all excited the first day , we were going to the park, after a long gap of the cold winters , we were going to have fun. I expected her to jump around in happiness and play on slides , swings and sea saws ,but to my disappointment , she was just lingering around me itself. Then when her friends arrived , she was all excited, so i sent her to play with them , but , again , she would climb up and stand still there, and again run back down the steps, instead of sliding . I was not sure what exactly was going on in her mind, then I accompanied her even though I wa scared of heights and sliding , I went for my daughter to give her more courage. I tried to make her sit , but she was not willing , and the truth was even I was scared , its funny but the truth. After making her sit next to me, I took her down the slide , once , twice and more , then I stopped and gave her a break. The first day was a failure, on the slide. 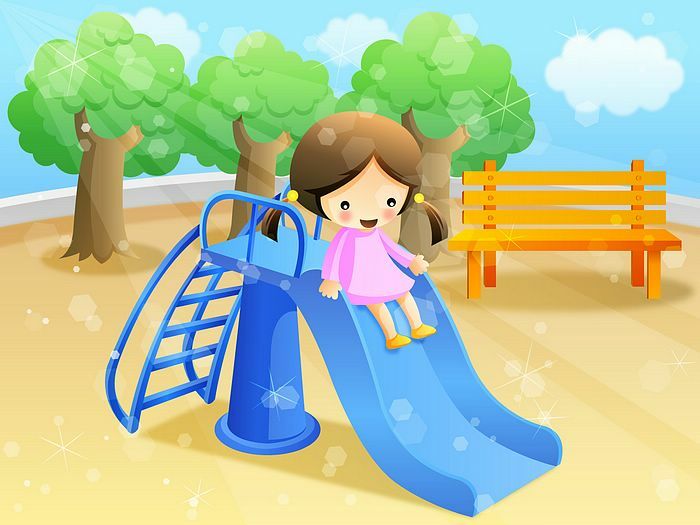 But to my surprise , the second day , she went happily on to the slide, even though she called me to accompany her , I did not and let her do it alone. Seeing all other excited kids around , she got the enthusiasm to try the slide alone , and yes she did it all alone and came running to me and told ” mamma , we did it” . And I was so pleased about myself and my lovely lil daughter.As a parent I withdrew on many things I wanted to do for her , but when her happiness was considered , I never put myself away from trying. Hope I do that now and then to see my lovely kid happy.